Would emptying carts weekly demand even more yard work? 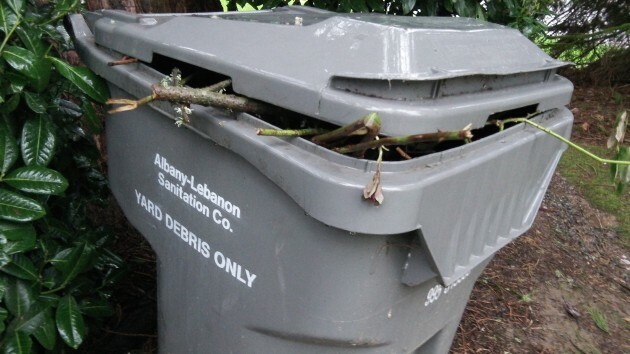 If the Albany City Council agrees with a proposal by Republic Services, the company will pick up yard debris weekly instead of every other week, but it will charge more too. The additional pickups would raise the price of trash service $3 a month, the company told the council Monday. Weekly pickup would also enable the company to accept household food waste in the same cart as yard debris. Food waste recycling is already available in Corvallis and Philomath and is being started in Lebanon. The company recycles yard debris and food scraps at Pacific Region Compost on Camp Adair Road. Republic had surveyed its more than 5,000 Albany customers by email and got nearly 1,200 responses. Of those, 631 said they preferred weekly yard debris pickup, 740 said they would support a weekly yard debris program that included food scraps, 915 said they would find a weekly schedule more convenient, and 677 said they might be able to reduce the volume of their other trash if they could put food scraps and yard waste into yard debris carts picked up weekly. None of the questions mentioned the additional cost. Republic, formerly Allied Waste, and Albany-Lebanon Sanitation before that, picks up trash and commingled recycling every week, and that would not change. A weekly yard debris pickup from spring to fall makes more sense (April – September) than paying the fee every month. In the late fall and winter I can go months without filling the bin. I don’t see a need for this expense. Most weeks we do not fill up our yard cart, and when we do get ambitious, it’s fairly easy to pile up the dead branches and shrubs that don’t fit into the cart all in one week, and put them out in two. Every week service would be wasted on us. Gordon’s comment above about perhaps a 6 month service of this type, spring through fall, may make sense as a compromise, if the city does approve this. But I’d rather not approve this proposal. I think the city needs to do their own homework, going door to door, through surveys or just standing outside the post office talking to locals, before approving, what amounts to another $36 fee on every household in the city. Having a 30 gal. can, my bill is $36.62 every 2 months. A $6 increase is 16% increase for me. My SS COL increase was 1.7%. Even worse for those with a 20 gal. can. Around 20%. I filled out the survey and found it to be pretty biased for providing weekly service. They claimed people use it frequently 10 months out of the year. I find that to be totally bogus. I can get by with every other week during the “busy” 3-4 months by using a bit of planning when I mow the lawn. One can also dump yard clippings in the garbage can if they want as much as they would hate that. ONE MAIN PROBLEM I see with Republic Services is they won’t accept cash for payment. HOW can that be legal? I actually find it UNAMERICAN, since it states right on our currency “for all debts public and private”.! I think the city council should refuse to allow them to do business in the city until they do. Of course these sheep will go along with the increase because they get a few more pennies per month from the “Privilege Tax”. I wouldn’t be against it as much if this was a March-May thing. After that, most everybody’s lawn is brown because we can’t afford to water. Well, well, well. We now know what truly motivates both Republic and the City. And it ain’t improved service levels to customers. Are you certain it is an increase of $3 per month? Republic currently bills me $36.62 every other month whether I use their service or not. I am thankful for their service during the times I use it. If the bill goes up to $42.62 every other month that is a 16.4% increase! For a service I will only use about half the time, so now we’re in the 30-35% increase range! I can understand what motivates Republic, but why do I get the feeling that the city council views this level of pain on it residents as a good thing? What does “Household food waste” include. Most composting information says DO NOT include, meat, bones, or fat as those items tend to draw pests (rats, mice, etc). My wife pointed out another flaw for the chef of the house – it means an extra container to collect those “recycled items” in to carry them out to the yard wast bin. Extra steps that I’m sure many will agree with. Since Lebanon has had this foisted upon them, why not have Republic survey those customers 6 months from now? As it stands now, if this were to pass, Republic would start implementing this “service” right at the tail end of the busy yard debris season. That’s $.75 for every house they drive by that doesn’t have a yard cart placed at the curb. I don’t understand the point about 75 cents. For at least 6 months of the year, people will have no use for yard trash carts, so they won’t put them out. I can’t imagine people putting in a few pounds of “food scraps” and then hauling the cart to the curb every week nor letting the scraps rot until the can is full enough to justify moving it. We get 26 MORE pick ups per year for an ADDITIONAL $36. That’s about 42-46 more pick ups than I need. A customer has the option of purchasing an additional yard cart. Let those that think they need it, buy it. I hadn’t considered the option of just offering a 2nd cart for those who generate 2 cartloads every 2 weeks. That suggestion sounds logical to me. I encourage the council to say no to this extra, unnecessary, service offer. If nutria carcass is not acceptable I suppose that dog, cat, rabbit, etc. would also be classed the same. I wouldn’t be surprised to see a service such as this abused in that way. What has the experience been in locations with this service? I don’t see how they are going to be able to determine whether or not any non-acceptable item is placed in the cart. There are times of the year that this service would be a big help for my household, but not for a full twelve months.